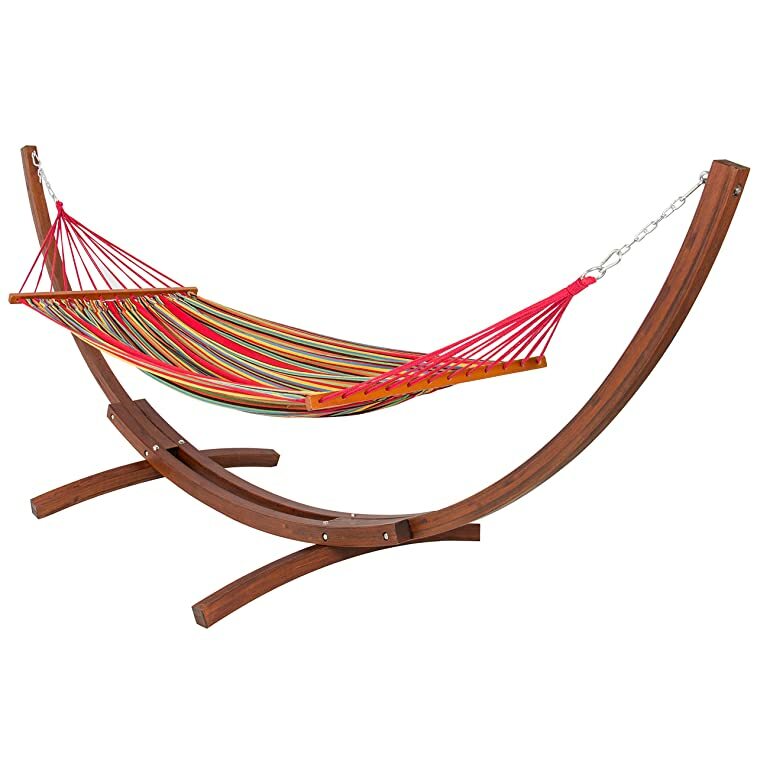 Best Choice Products presents you this brand new hammock and curved wooden stand combo. Enjoy this beautiful new hammock on the patio, deck, or in the garden. The wooden stand adds an elegant touch to any backyard and one time assembly is required. The solid wood stand is sturdy and does not require other supports. You can enjoy your evenings by swinging in our comfortable and stylish new hammock. We purchase our products directly from the manufacturer, so you know you’re getting the best prices available. NEW PRODUCT WITH FACTORY PACKAGING. FEATURES: Wooden Arc Frame: 100 imported Russian pine. Wood is coated with varnish to protect. Sturdy wood frame and durable cotton hammock. No support needed for wooden stand. Easy to assemble. SPECIFICATIONS: Product dimension: 145″ (L) X 45″ (W) X 55″(H). Product weight: 61.6lbs. Color: Natural Wood Stand. PLEASE NOTE: Our digital images are as accurate as possible. However, different monitors may cause colors to vary slightly. Some of our items are handcrafted and/or hand finished. Color can vary and slight imperfections in the metal work are normal and considered evidence of the hand-finishing process, which adds character and authenticity to those items. 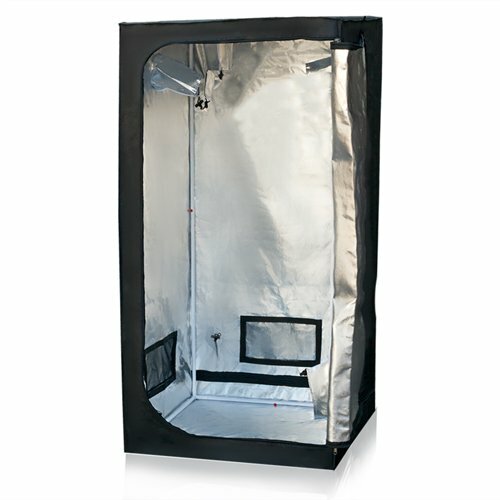 SKY843 Best ChoiceProducts Grow Tent Reflective Mylar Hydroponics Plant Growing Room New, 32" X 32" X 63"
This grow tent helps you achieve the very best climate for your in-door hydroponic plants ‘growth. Our dark room grow tent is highly reflective; complete Non-toxic, waterproof and extremely heat insulative, perfect environment for indoor cultivation. Can be constructed and display anywhere such as living room, bedroom, loft, garden shed or even garage. Our Hydroponics tent is suitable for all beginner and veteran gardeners. PRODUCTION INFORMATION: 32″(L) x 32″(W) x 63″(H); Large door makes moving plants and setting up lights easy; Exterior: black 600D polyester nylon plastic lined grow tent; Interior: 100 highly reflective waterproof Mylar; Highly reflective non-toxic waterproof PVC plastic; Removable Waterproof PVC Plastic floor tray; Built-in heavy-duty zippers and Velcro; easy to assemble and disassemble; Multiple Vents: (3) rectangles (2) 3″ diameter, (5) 5″ diameter; Multiple air ventilation vents for 3in or 6in filter fan output; Side pockets for storing PH meters; Metal rails for lighting equipment; Strong powder-coated framework with flexible plastic connectors; Light-proof material: prevent light from entering or exit for controlled light cycles; Removable roof cross members makes it easy to adjust lighting and accessories; Compatible with 400Watt, 600Watt and 1000W grow lights set up EASY CONSTRUCTION: Quick Assembly and disassembly, less than 45minutes (no tools required); Extremely lightweight and easy to move once constructed; Heavy-duty metal tube joiner allowed assembling the tent frame in minutes; High quality metal frame, designed to simply push-fit together; Quality steel rails to hang a grow light from the frame in the top of the grow tent steadily PACKAGE INCLUDES:; (1)Polyester Nylon Plastic Lined with Reflective Grow Tent; (1)1 Set Metal frame; (1)Removable Water Proof PVC Plastic Floor Tray; (1) Assembly Instructions. For those lazy moments of relaxation, whats better than sticking with the classics? This hammock will envelop you in soft, luxurious 100 cotton for a nostalgic, time-honored way to let the days stress melt away. Snuggle up with a loved one or a beloved pet, or enjoy a good book with a soft, outdoor breeze. Whatever your way to comfort, this hammock will help you get there. SPECIFICATIONS: Overall Dimensions: 115(L) 48(W) x 43″(H); Bed Length: 76; Bed Width: 57; Weight Capacity: 450 lbs. ; Weight: 30 lbs. ; Color: Red, Orange, Green; Material: Cotton, Steel; Assembly required (with instructions). Best Choice Products presents this brand new Loveseat Glider. This glider comfortably seats 2 people and moves with a soothing back and forth gliding motion. 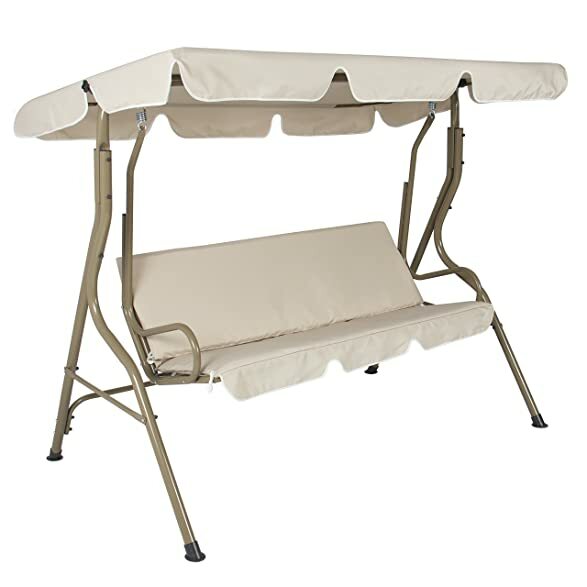 This item is low-maintenance, easy to assemble and has removable cushions that are weather and stain-resistant. The glider is great for year round relaxation and is perfect for any backyard. We purchase our products directly from the manufacturer, so you know you’re getting the best prices available. NEW PRODUCT WITH FACTORY PACKAGING. FEATURES: Perfect for any outdoor living area. 2 seat cushions and 2 back rest cushions. UV and weather resistant polyester cushions. Powder-coated steel frame. Easy to clean. Some assembly required. SPECIFICATIONS: Bench dimension: 21″(L) x47″(W) x36″(H). Seat Cushion dimension: 21″(L) x21″(W) x 2.5″(H). Product weight: 58.42lbs. Supports up to 500 lbs. Color: Beige. PLEASE NOTE: Our digital images are as accurate as possible. However, different monitors may cause colors to vary slightly. Some of our items are handcrafted and/or hand finished. Color can vary and slight imperfections in the metal work are normal and considered evidence of the hand-finishing process, which adds character and authenticity to those items. 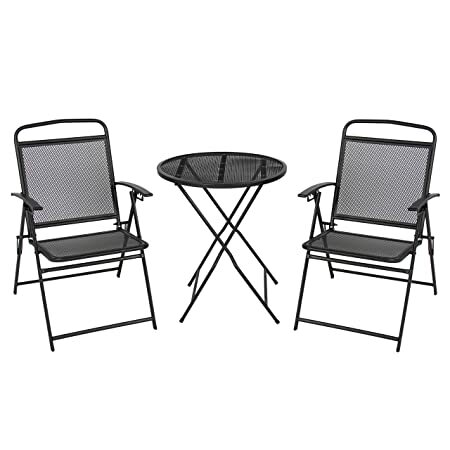 Best Choice Products presents you this brand new Universal Patio Dining Bistro Set. Enjoy all your outdoor dining on the patio, on the deck, or in the garden. This dining set is foldable and portable for your convenience. It adds a nice touch to any location and is easy to assemble. Make us of the great weather by dining outdoors. We purchase our products directly from the manufacturer, so you know you’re getting the best prices available. NEW PRODUCT WITH FACTORY PACKAGING (not used or refurbished). FEATURES: Includes 1 wrought iron table and 2 adjustable chairs with armrests. 5 adjustable backrest position. Foldable for convenient storage. No Assembly required. Sturdy and comfortable. Perfect for outdoor use. SPECIFICATIONS: Chairs dimension: 21.3″ (L) X 18″ (W) X36″ (H). Height from seat to floor: 17.5″. Table dimension: 24″ (Dia) X 28.5″ (H). Product weight: 39.6 lbs. Chair weight capacity: 250lbs. Table weight capacity: 150lbs. Color: Black. PLEASE NOTE: Our digital images are as accurate as possible. However, different monitors may cause colors to vary slightly. Some of our items are handcrafted and/or hand finished. Color can vary and slight imperfections in the metal work are normal and considered evidence of the hand-finishing process, which adds character and authenticity to those items. 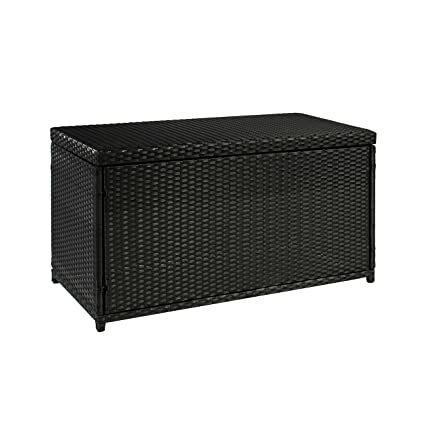 Best Choice Products is proud to present this beautiful new wicker deck storage box. This sun-resistant storage box provides plenty of space to store any garden accessories, pool toys, and furniture cushions. It serves as a multipurpose storage trunk and adds style to any backyard. This storage box is great for keeping your backyard clean and organized. We purchase our products directly from the manufacturer, so you know you’re getting the best prices available. NEW PRODUCT WITH FACTORY PACKAGING (not used or refurbished). 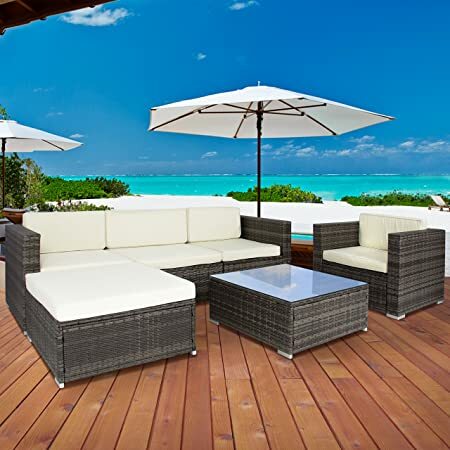 FEATURES: Smooth and soft sun-resistant wicker. Easy to clean with a damp cloth. Environmentally friendly & 100 recyclable. Elegant outdoor storage that serves as a stylish patio accessory. Assembly required. SPECIFICATIONS: Product dimension: 40″ (L) x 20″ (W)x 22″(H). Product Storage dimension: 38.3″ (L) x 17.9″ (W)x 18″(H). Product weight: 31lbs. Color: Black. PLEASE NOTE: Our digital images are as accurate as possible. However, different monitors may cause colors to vary slightly. Some of our items are handcrafted and/or hand finished. Color can vary and slight imperfections in the metal work are normal and considered evidence of the hand-finishing process, which adds character and authenticity to those items. 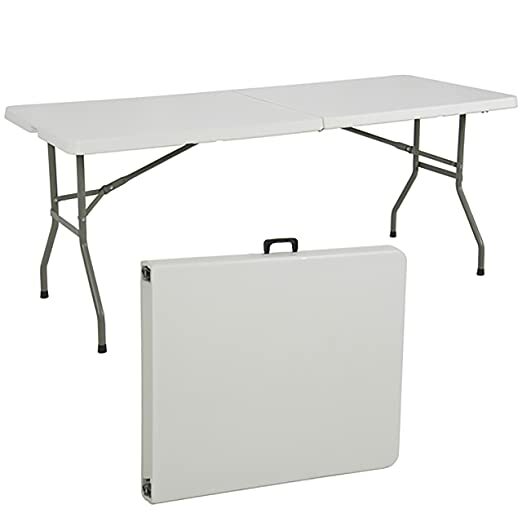 Best Choice products presents this brand new 6ft folding table. This table is great for entertaining and can be used as a serving table, game table, or outdoor dining table. It features a polyethylene top with a sturdy tubular steel coated legs and frame and sets up quickly to provide ample space for guests to sit and eat. 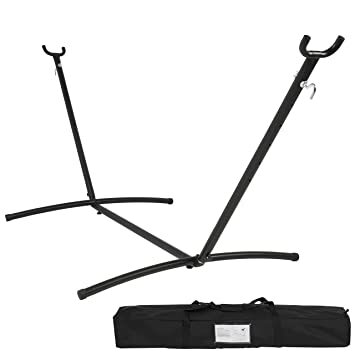 It folds easily, is light-weight, and compact enough to fit under a bed or in a large closet. Legs come with rubber footing to protect floor surfaces from damage. NEW PRODUCT WITH FACTORY PACKAGING FEATURES: Granite off-white color Durable, green environmental and recycled material HDPE Construction quality, high-density polyethylene (HDPE) lightweight blow-molded plastic Light-weight, easy to move and store Gray powder coated wishbone legs Heavy duty 25-gauge steel legs Table surface is slightly textured to avoid scratching, but smooth enough to write on Easy to clean- just use a mild soap and a soft-bristled brush; for tough stains, use a mild abrasive such as Soft Scrub Water proof, resists acids, alkalies, and high temperatures. Very long service life for several years of use. Can withstand 212F Gravity slide lock for extra stability Can apply to many field for indoor, outdoor, commercial and entertainment use, such as home, office, restaurant, hotel, church, party, wedding and so on SPECIFICATIONS: Overall dimensions: 30″(L) x72″(W) x 30″(H) Tabletop size: 30″(L) x 24″(W) Tabletop thick: 1.75” Folded size: 29.5” x 36″ x 3.75″ Seating capacity: 8 Weight capacity: 300 lbs. 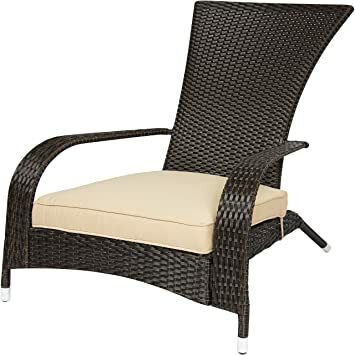 Best Choice Products presents you this brand new Wicker Adirondack chair. 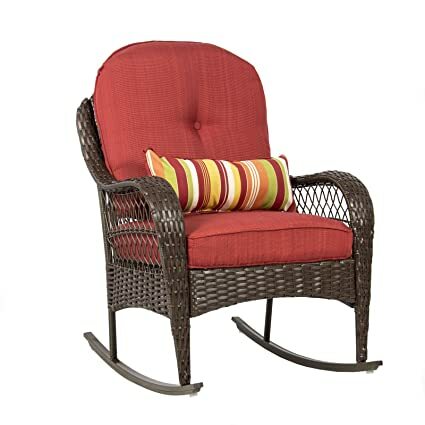 Relax on the patio with this all-weather Wicker Adirondack Chair. Assembly is easy and it will add a stylish touch to any backyard. We purchase our products directly from the manufacturer, so you know you’re getting the best prices available. NEW PRODUCT WITH FACTORY PACKAGING (not used or refurbished). FEATURES: Stylish and comfortable for backyard lounging. Smooth and soft sun resistance wicker sofa in heavy duty steel frame. Washable, removable, fade-resistant cushions. Smooth and soft sun resistance wicker. Easy to clean with damp cloth. Environmental friendly and 100 percent recyclable. SPECIFICATIONS: Product dimension: 33″ (L) X26 ” (W) X33″(H). Backrest:19″(W) X28″(L). Seat:20″(W) X20″(L). Product weight: 26.33lbs. Weight capacity:250 lbs. Color: Dark brown with beige cushion. PLEASE NOTE: Our digital images are as accurate as possible. However, different monitors may cause colors to vary slightly. Some of our items are handcrafted and/or hand finished. Color can vary and slight imperfections in the metal work are normal and considered evidence of the hand-finishing process, which adds character and authenticity to those items. 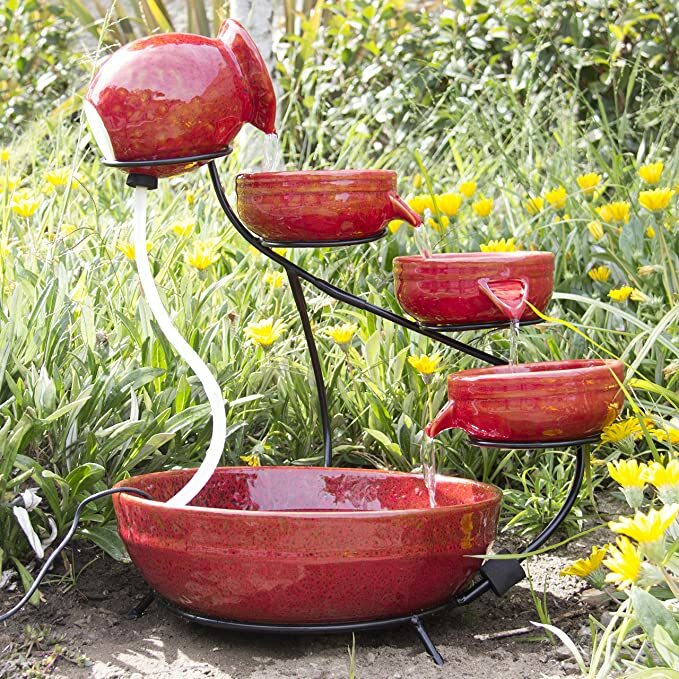 Best Choice Products presents this brand new red ceramic solar fountain. This beautiful fountain is completely solar powered and does not require the use of electrical outlets. Enjoy the soothing sound of trickling water in the comfort of your backyard or Zen garden. Our solar fountain works in direct sunlight so make sure you give it some sun before using. We purchase our products directly from the manufacturer, so you know you’re getting the best prices available. NEW PRODUCT WITH FACTORY PACKAGING. FEATURES: 4-tier cascading fountain. Separate solar panel provided. Easy set-up and no operating costs. Ceramic bowls with glossy finish. Quiet Pump. SPECIFICATIONS: Product dimension: 14.5″ (H) X16 ” (W) X16″(L). Product weight: 13.2lbs. Color: Red. PLEASE NOTE: Our digital images are as accurate as possible. However, different monitors may cause colors to vary slightly. Some of our items are handcrafted and/or hand finished. Color can vary and slight imperfections in the metal work are normal and considered evidence of the hand-finishing process, which adds character and authenticity to those items. Best Choice Products presents this brand new 3 Cushion Canopy Swing. This canopy swing seats up to three people comfortably. This item is low-maintenance, easy to assemble and the fabric is weather and stain-resistant. This canopy is the perfect summer accessory to escape the heat and relax. Our swing will look great in a backyard or front porch. It will definitely bring you much needed relaxation on those hot summer days. We purchase our products directly from the manufacturer, so you know you’re getting the best prices available. NEW PRODUCT WITH FACTORY PACKAGING. FEATURES: Perfect for any outdoor living area, Adjustable canopy, UV and weather resistant fabric, Powder-coated steel frame, Easy to clean, Some assembly required. 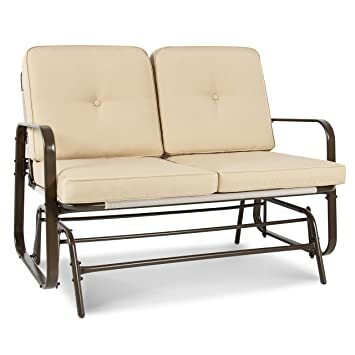 SPECIFICATIONS: Overall dimension:73″(L) x44″(W) x68″(H), Seat dimension: 58″(L) x21″(W) x21″(H), Product weight: 82lbs, Supports up to 750 lbs, Color: Brown. PLEASE NOTE: Our digital images are as accurate as possible. However, different monitors may cause colors to vary slightly. Some of our items are handcrafted and/or hand finished. Color can vary and slight imperfections in the metal work are normal and considered evidence of the hand-finishing process, which adds character and authenticity to those items.